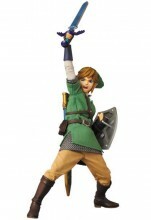 By now, most Zelda fans have probably heard of First4Figures and Figma considering the wonderful contributions the companies have made to Zelda collections everywhere. 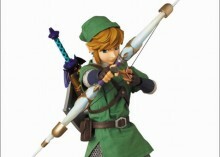 Now, though, a new company is quickly getting recognition with their own lineup of Zelda-related figures. Japanese toy manufacturer Medicom has a fairly wide range of merchandise ranging from their small and affordable Ultra Detail Figures (UDF) to the large, gorgeously detailed Real Action Heroes (RAH) line of figures. 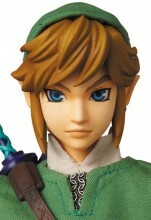 Last Summer, Medicom announced three new Zelda figures for the UDF line, set to be released next month. 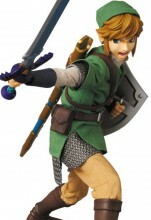 Now they’ve stepped up the game with the announcement of a Skyward Sword-themed entry to their Real Action Heroes. Jump inside to see this sweet new figure! 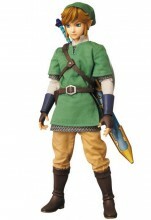 Standing at 30cm (or just under 12 inches), this new entry to Medicom’s Real Action Heroes line of figures will be releasing this November – almost exactly a year after last year’s Skyward Sword Link Figma. Pre-orders are now being taken for this amazing figure, which will be debuting with a pretty big price tag of ¥20,790 (approximately $220, £144, or €166). Ouch. Still, that price looks to be worth it; this is one very high quality figure. 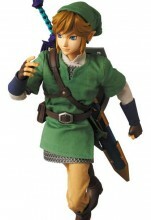 Link’s outfit is actually made of real cloth, and much like last year’s Figma he is also fully pose-able. 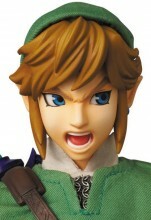 Unlike the Figma, though, he comes with more than just his sword and shield; this set also includes his Sacred Bow and the Tough Beetle as well as what seems to be eight different facial expressions. On top of his two faces (calm and angry/yelling) he also has changeable eyes to further customize his expression. 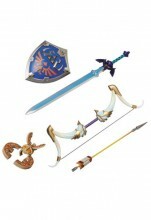 Personally, I would love to own one of these, but $220+ is way too much for me to shell out on a figure. For now I think I will stick with my Figma. What do you think of this figure? Can you afford the steep price tag that comes with this awesome piece of work, or will you be skipping this item? How do you like the design? Let us know your thoughts in the comments!